Monreale Abbey - Monreale Cathedral - See Palermo and Western Sicily. Monreale's cathedral and abbey are good reminders that the beauty of a particularly splendid church transcends that of any single work of art, however noble. Overlooking Palermo, the town of Monreale, from the Latin "Mons Regalis" (literally 'Royal Mountain'), straddles a slope of Mount Caputo about eight kilometers south of Palermo's cathedral. Set at about three hundred metres above sea level, the town overlooks the "Conca d'Oro," as the valley beyond Palermo is known. No extended visit of Palermo is truly complete without a visit to Monreale. The cathedral and its cloister represent the largest concentration of Norman, Arab and Byzantine art in one place. True, Palermo's cathedral is larger, but Monreale's exists in something far closer to its original twelfth-century state. The focal point of the town is its cathedral, an amalgamation of Arab, Byzantine and Norman artistic styles framed by traditional Romanesque architecture, representing the best of twelfth-century culture. The mosaics covering the cathedral walls are one of the world's largest displays of this art, surpassed only by Istanbul's Basilica of Saint Sofia, once an Orthodox church. (Unfortunately, many of those beautiful mosaics were destroyed or whitewashed when the Turks conquered Constantinople in 1453.) Monreale's mosaics cover over six thousand square metres of the church's's interior, an area larger than those of the splendid church of Saint Mark in Venice. 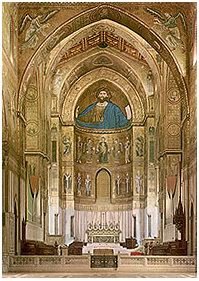 The mosaics of "Santa Maria la Nuova" (Saint Mary the New), the official name of Monreale Cathedral, are far more extensive than those of the cathedral of Cefalù, and while the mosaics of the Palatine Chapel in Palermo's Norman Palace are of equally exquisite craftsmanship, the latter leave many with the impression of a complex work of art in a restrictive space. Attached to the cathedral, the Benedictine cloister courtyard consists of 228 columns (paired, except for the corners which have four each), some inlayed with Byzantine-style mosaic work, each supporting an ornately carved capital. The capitals themselves depict scenes in Sicily's Norman history, complete with knights and kings. The style of the Norman knight figures evokes that of the knights depicted in the Bayeaux Tapestry, a chronicle of the Battle of Hastings. Historians have determined the date of the introduction of heraldry (coats of arms) in Sicily by the shields of the Monreale knight figures, which lack any heraldic decoration. The capitals strongly reflect the Provencal styles of the twelfth century, and at least three of what are thought to have been five master sculptors were probably from that region. The idea of building Monreale Abbey was the idea of King William II "the Good," grandson of the Roger II. On the site of Monreale had stood a small Arab hamlet named "Ba'lat," where local farmers gathered each morning to cart their produce to the souks of Bal'harm (Palermo). In the Norman era the area around Ba'lat, later renamed Monreale, became a favorite hunting ground of the Hauteville monarchs. In those days deer, boar and wild cats still roamed Sicily, where there were far more forests than today, and falconry was popular among the baronage. William's extensive royal hunting reserve extended across the valley to what is now Altofonte, and down the slopes of Mount Caputo toward Palermo (probably as far as the Royal Park or Genoard), perhaps encompassing some areas south of Monreale as well. Walter "of the Mill" (actually "Offamilias" indicating his familial link to Sicily's Hauteville kings), the English bishop of Palermo, was the head of a faction of nobles that sought to influence and persuade the young king into granting them more power. This faction also hoped to attenuate the power of Muslim ministers and functionaries in William's court. Walter had been William's tutor when the king was a child and during his mother's regency. William was just 13 years old when his father, William I, died in 1166, and until he reached his majority in 1171 he was subject to the regency of his mother, Margaret of Navarre. However, the kingdom was actually controlled by Matthew d'Aiello, the royal chancellor, and Walter, the bishop of Palermo --the latter having attempted to exert undue influence on William as his tutor. The young sovereign wished to demonstrate his independence through the construction of a grand cathedral. The Benedictines, already present in Sicily, readily obliged. The first of King William's objectives was to establish himself firmly as sovereign. William had only been crowned in 1171 when he turned eighteen. Construction began in 1172. The superstructure took four years to build, reaching completion in 1176. Work on the mosaics and cloister was completed by the time of the young king's death in 1189. Apart from demonstrating his true power to the Sicilian nobility, is possible that William wanted the cathedral to impress his subjects in an equal measure. Many Muslims from Palermo had fled to the hill country surrounding the capital after a rebellion against William's father in 1161, and others already lived in towns in the region. Led by Matthew Bonellus, a vocal element of the Siculo-Norman nobility had begun to support an anti-Muslim policy, leaving the 'Saracens' to establish themselves in easily-fortified towns of the interior, though they were nominally loyal to William. Though Bonellus himself was eventually eliminated, the cathedral, actually fortified with embattled towers and slit-windows as if it were a fortress, was strategically important for guarding the passes that served as the gateway to these communities. The nearby hilltop castle of Castellaccio bolstered this military strategy. Though little of the monastery except the cloister survives, the monastery of Monreale originally boasted twelve embattled towers and thick walls. A few of the towers are still visible. The Arabs did eventually rebel, after King William's death, in reaction to the mistreatment and excessive taxation imposed upon them by the Abbot of Monreale, under whose feudal authority they had been placed by William II and the Pope. The cathedral itself was attacked by the Muslims on several occasions, the worst incident occurring in 1216 during the reign of Frederick II (Hohenstaufen). However, the "rebellions" were never a serious threat to the Norman, Swabian (and at all events Christian) rule of Sicily. In 1246, Frederick II dispatched a large army from Palermo to rein in what resistance remained, taking control of Corleone and San Giuseppe Jato. Another reason for William's construction of the cathedral was his desire to establish the Roman Catholic church, known as the "Latin" church in those days, as the official church of Sicily. There were still many Orthodox Christians and Muslims in twelfth-century century Sicily, and a number of Jews. Although Orthodoxy was permitted and Islam tolerated, William embraced Papal authority. Thus, despite the mosaic icons which give it the appearance of an Orthodox basilica, Monreale was actually part of the 'Latinizing' of Sicily. Pope Alexander III granted the abbot of the Benedictine monastery episcopal privileges in 1174, and elevated Teobald to the rank of archbishop in 1183. The installment of a bishop in Monreale who owed his position to pontiff and sovereign and who, as an outsider, had no stake in local politics, neatly accomplished the political purposes of both powers. As we've mentioned, work on the cathedral was begun in 1174. In 1177, at twenty-four, William married Joan, daughter of King Henry II of England. The marriage made William brother-in-law to Richard I "Lionheart" and John "Lackland," Henry's sons. In 1170, William's father-in-law had instigated the murder of Thomas Becket, then Archbishop of Canterbury. Canonized in 1173, Saint Thomas is depicted in a mosaic icon of the cathedral's main apse near the altar (as one faces the apse it is the second icon to the right of the apse niche). This is believed to be the first public work of art honoring the English saint. Though William sought to make his realm to be a European one, he engaged in certain practices somewhat unusual for a Christian monarch of the Middle Ages. Not only did he have many Muslim ministers, astrologers and doctors in his court, William is said to have kept a harem in his palace, and to have spoken, read and written Arabic. That work on the cathedral was completed before William's death (aged just 36) in 1189 was indeed a fortunate thing, for the period of quasi-anarchy which ensued as rival claimants sought the crown did not bode well for costly construction projects. Externally, most of Monreale Cathedral is not particularly striking. Its front facade faces west, looking onto Piazza Guglielmo. Two massive square bell towers flank the main church entrance. The porticos are not original components of the structure. The sides of the cathedral are over a hundred metres long. From Via Arcivescovado, the street behind the cathedral, can be seen the complex geometric inlay of the apse --a kind of symmetry which reflects Muslim spirituality. Framed by a typical medieval arch, the Romanesque bronze doors under the main (front) portico were manufactured in the workshops of Bonanno of Pisa in 1186. Constructed in the same year, the side doors were designed by Barisano of Trani set within a squared frame decorated in Arab mosaic. Each door features panels on which are carved various religious figures amidst floral and other symbolic motifs. The floor plan of the cathedral (see the diagram below) combines elements of both a traditional Western (Latin) basilica and an Eastern (Orthodox) one. The combination of Greek and Latin elements is a distinct feature of Norman architecture in Italy. The cathedral has a wide central nave between two smaller aisles. Nine monolithic columns of gray granite support the eight pointed arches on each side of the central aisle, for a total of eighteen columns, each bearing a Corinthian style capital. Each individual capital is sculpted with a different motif featuring religious figures and symbols. Only one of the eighteen columns is not made of gray granite, the first column on the right of the front entrance, which is made of "cipollina" marble. The roof of the cathedral is made of wood, carved and painted in great detail, and while its style shows a strong Saracen influence the present roof is, in fact, a restored reproduction dating from 1811 when the original roof was severely damaged by fire. The present roof is a faithful reproduction, very similar to the original. The sixteenth-century floor of the church is composed of white marble with multi-colored granite and porphyry patterns and borders. The splendid mosaics in the interior of Monreale cathedral are its principal artistic attraction. Their subtle beauty creates an atmosphere of solemn tranquility and perhaps even awe. The mosaics cover practically all the surfaces of the cathedral's walls, except for the ground level, up to a height of two meters, where the walls are finished in white marble bordered with polychrome inlay decoration. All of the cathedral's mosaic figures (many are icons) are placed upon a background of gold mosaic "tesserae" (tiles). The interior of the church is about 100 meters long by 40 meters wide. There are a total of 130 individual mosaic scenes depicting biblical and other religious events. The Old Testament is depicted on the walls of the central nave, starting from the Creation and ending with Jacob's Fight with the Angel. The mosaics on the side aisles illustrate the major events of the life of Jesus, from birth to crucifixion, and include a cycle illustrating the miracles worked. Many of the mosaics are accompanied by inscriptions in Latin or Greek. 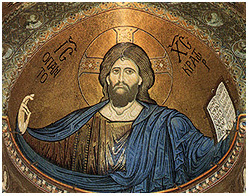 Dominating everything is the imposing mosaic of Christ Pantocrator ("Ruler of All") located on the central apse over the main altar. The entire image is thirteen meters across and seven meters high. Beneath the stupendous portrait of Jesus is a mosaic of the Theotokos (Mother of God) enthroned with the Christ child on her lap. This depiction is flanked by mosaics of the angels and various saints and apostles. There are mosaics of numerous other saints and scenes from the Gospels all about the transept area, including the previously-mentioned icon of Saint Thomas Becket. Two noteworthy mosaics are located on the sides of the presbytery, over the royal and episcopal thrones. The one above the royal throne shows Christ crowning William II. It is patterned on the icon in the Martorana (in Palermo) showing Roger II crowned by Christ. The mosaic over the episcopal throne shows William II offering Monreale cathedral to the Virgin. In the West it was rare for living monarchs to be represented in a Heavenly setting in this manner. 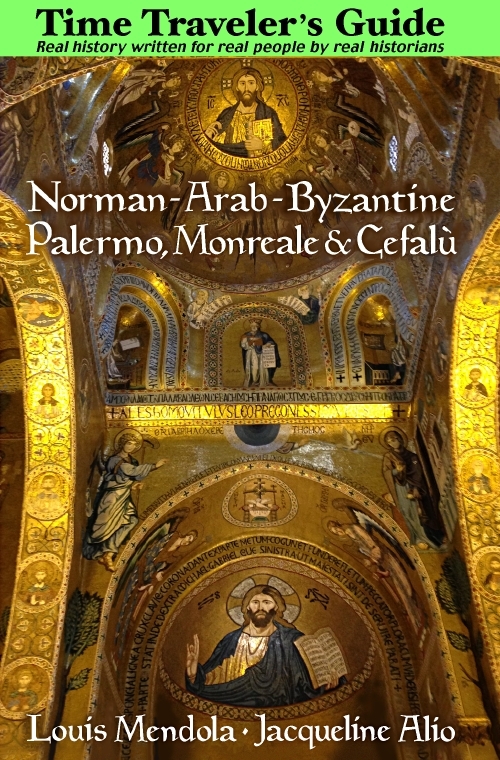 Our printable Key to Monreale's Mosaics explains most of the principal mosaics of the nave, with notes on those of the apse and transepts. Monreale Cathedral also houses several royal tombs. That of William II is a white marble work dating from the sixteenth century. William's father, King William I "the Bad" lies in the deep-red porphyry tomb which dates from the twelfth century and is, presumably, his original. William II's mother, Margaret of Navarre, is also interred at Monreale. Curiously, so is the heart of King Louis IX of France (Saint Louis). The royal cortege stopped here for a funeral en route to France following Louis' death during the Tunisian Crusade (in 1270) when his less-saintly younger brother, Charles of Anjou, was king of Naples and Sicily. Except for some foundations and external walls, the cloister court proper is the only part of the monastery standing today. Its plan is a perfect square, measuring forty-seven metres on each side, enclosing a covered walkway. As we've mentioned, there are 228 columns. Carved into the capitals of the columns are all manner of Biblical figures, mythological scenes, quasi-heraldic elements, Arab warriors and Norman knights, as well as floral motifs and fauna. Perhaps the crowning glory of the cloister is the Arab fountain in the southwest corner. The fountain is almost a mini-cloister within the cloister, surrounded by its own four-sided colonnade. Longstanding tradition says that William, who had a small palace next to the cathedral, often washed his face in this fountain. Our printable map of Monreale's cloister capitals describes the fascinating carvings of over thirty of the capitals. The garden terrace or "belvedere" is also worth visiting. Affording a panoramic view of Palermo, it is reached through a courtyard near the cloister, in a corner of the square. Next door, the monastery galleries sometimes host interesting exhibits. While the small crypt is usually closed to the public, the cathedral's Treasury Museum houses some interesting relics and other ecclesiastical items. The stairs and passages to the roof encircle the church, affording good views of the cloister, the inside of the taller tower, and of course the valleys around Monreale. For Visitors: Monreale's cloister is usually open from 9:00 AM to 6 PM Monday through Saturday, and from 9:00 to 12:30 on Sundays year-round, though afternoon schedules may vary. Monreale is also known for its craft and artisan shops, specializing in ceramic art and mosaics ranging in style from the Byzantine to the Baroque to folk and abstract. Monreale boasts some of the island's best mosaic galleries. Two of these are found on Via Arcivescovado in back of the cathedral. Other noteworthy artisan shops will be found on Via Ritiro and the nearby streets. Getting There: Driving to Monreale is not advised because you're not likely to find a parking space in the town. However, Monreale, which is actually on the edge of the city of Palermo, can easily be reached with the number 389 bus departing from Piazza Indipendenza in Palermo. The bus follows Corso Calatafimi, one of Palermo's main streets, and takes about thirty minutes, depending on traffic, to arrive at Monreale, with its terminus in the square next to the cathedral. A taxi will co cost you about 30 euros from the centre of Palermo. Keep in mind that finding a taxi to take you back down to the city may not be very easy. About 5 kilometers north of Monreale on the steep, winding Via San Martino we come to the Castellaccio (literally "Big Castle"), perched atop Mount Caputo, over seven hundred metres above sea level. The castle is a twelfth-century fortress erected by the Normans. Its strategic position was intended to guard all the possible approaches to the city, either by land or by sea. This castle is one of a handful of medieval fortresses left standing in the immediate Palermo area, the others being the largely reconstructed Steri (in Piazza Marina in Palermo) and the ruins of Castello al Mare (near the Port of Palermo), neither of which retains much of its original form as Castellaccio. The fortress provides one of the most spectacular views of the area, so make sure you visit on a clear day if possible. The castle is well preserved owing to its rather remote location. The ride from Monreale takes about 15 minutes, and once you park on the side of the road (or in the small parking lot) you have to take a fairly demanding 20-minute hike up a winding path along the side of the mountain to reach the castle. This hike is never advised for any but the fit or stout-hearted. The castle itself is sometimes open during tourist season, with tours arranged by the Sicilian Alpine Club. (The club may make special arrangements for your visit, especially if you are part of a large group or organization.) The castle can be visited when it's closed, if you want to see the exterior and view the magnificent panorama. It's also a good place to have a picnic or to enjoy nature. A few kilometers further up the road is the Benedictine abbey of San Martino delle Scale. The original monastery was probably founded by Pope Gregory the Great circa 600. It was burnt down by invading Arabs in 829, and built anew over the ruins in 1346. It is still used. Among its art treasures is a splendid marble staircase by Venanzio Marvuglia from the 1700's and Ignazio Marabitti's famous "Saint Martin and the Beggar," dedicated to the patron saint of the abbey. There is also a painting titled "Daniel in the Lions' Den" by Monreale's own Pietro Novelli, dating from the late 1500s. The church choir has a magnificently elaborate carved walnut chorus section. Parts of the monastery, which is actually quite large, are clearly medieval, though many sections were reconstructed and expanded after the fifteenth century. The abbey is usually open from 8:30 to 12:30 in the mornings and 4:30 to 6:30 in the afternoons, and between masses on Sunday morning, and also from 5 to 7 PM. There is free parking and no admission fee.